Welcome to the latest Just Add Ink challenge, where this week we have a colour challenge for you - peach, pool and aqua/teal. I used my newly-created ink swatch book to match the colors with my inks and came up with Lagoon and Mountain Mist from Altenew and Melon and Sunkist from SSS. I took a panel of white cardstock and blended Lagoon in the bottom left, fading out to Mountain Mist. Once I was finished, I spritzed it with a Perfect Pearls mist and die-cut it using a stitched die. I adhered that to a white card base and set it aside. 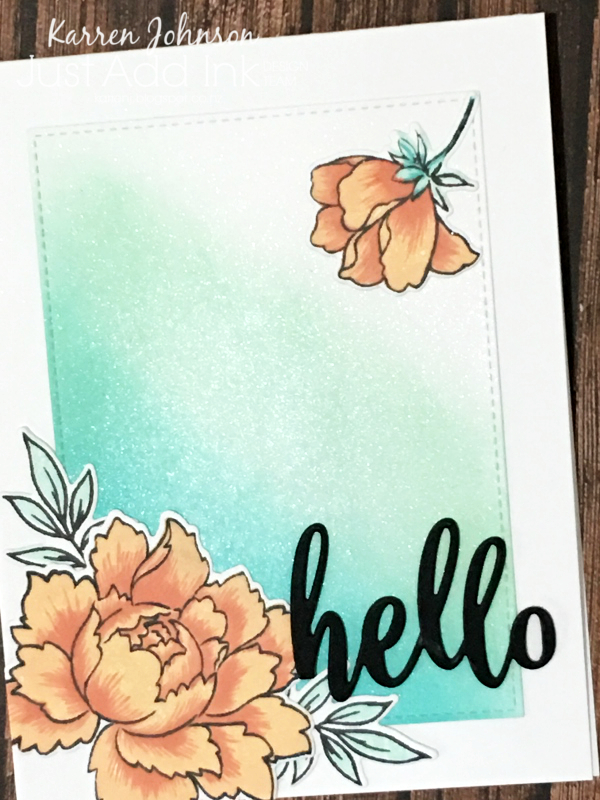 The flowers were stamped with Melon and Sunkist inks and for the leaves, I used Mountain Mist. They were cut with the co-ordinating dies and adhered to the bottom left and top right of the card. Finally, I added a black die-cut sentiment. Thanks for visiting! 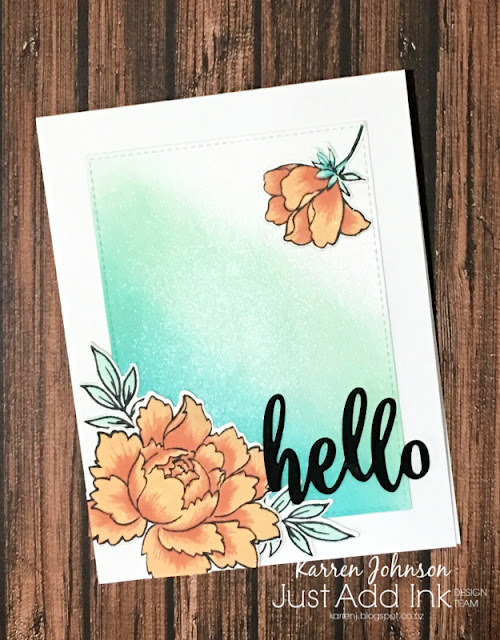 The design team have some gorgeous cards using these fresh colours, so head on over and check them out. I've just ordered my first Perfect Pearls pearl, Karren... can one make their own mist? Must Google that! In the meantime, I'm just going to ogle your gorgeous card for a bit... SO pretty! Oh, wow, your background is amazing! The flowers are so pretty, and the pop of black is a great finishing touch. Absolutely beautiful Karren, the ombre in the background is perfect! Your shimmery background is so beautiful. It's perfect with the flowers! Completely and totally in love with this (yeah, I know you are shocked with that, haha!). Such pretty coloring! Utterly stunning! I adore the background you've created and the flowers are just perfection! Absolutely gorgeous card, Karren! Your peonies are so pretty and I love how you inked the background so much...simply stunning!! !